A tool or technique that makes some aspect of one’s life easier or more efficient. Web sites now exist, where Lifehackers (followers of the movement) can trade lifehacks – suggestions on how to reduce chaos and make their lives more enjoyable. What kind of lifehacks do we use on a constant basis that make the singer’s life more enjoyable? We have covered some social-networking sites, online audition notices, and even resources to find an elusive score in the past. But, what else can help as we cruise down the highway toward diva stardom? The Sybaritic Singer is here to bring you more tips and tricks about the WWW of tra-la-la. Sybaritic Faithful: this may come as no surprise to you. I love brainstorming. I love being inspired by things I read and hear. I want to keep all these little tidbits to recall when I’m writing blog posts, researching a role, or power-networking. This is why I love that bubbl.us came into my life. 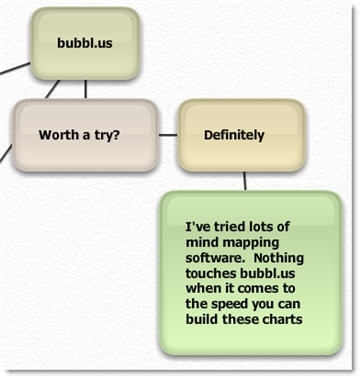 Bubbl.us is a free web application that lets you brainstorm in mind-mapping form. I originally found bubbl because of a painter friend that mind-maps her life on a very large canvas. I thought to myself, “Wow. What a great idea. It would be great to have a visual reference of all the little clusters in my life. I just wish I could do it online.” Et voilà, now I have my online version of the mind map that outlines places I have lived, performances I have done, people I have met and plead to for references, and places I have worked. It is very interesting to see the connections between the people and places. Another wonderful brainstorming tool is Zotero, a beautiful little Firefox extension that helps you “collect, manage, cite, and share your research sources. It lives right where you do your work—in the web browser itself.” Why I didn’t know about this during my graduate school years is a mystery. This is the perfect extension for when you are reading an article or review and you want to save the information for later. Better than a bookmark, you can organize sources into different folders, tag items, and even take notes along the item you are perusing. Zotero’s interface is iTunes influenced so it is easy to drag-and-drop your items. I also love that one of their taglines is – Goodbye 3×5 notecards. Hello Zotero. Somewhat similar in concept to Zotero is the more popular Evernote. “Chances are, if you can see it or think of it, Evernote can help you remember it. Type a text note. Clip a web page. Snap a photo. Grab a screenshot. Evernote will keep it all safe.” All of your information in Evernote is diligently indexed and easy to find. Plus, you can use it on phones, computers, and through their website. Let’s face it: we have a lot of things to remember in our lives. Not to mention, we need a lot of memory space for all the roles and songs and scores that have to be memorized. Let’s turn over some of the little details to a very efficient processor. Whadya say? Web sites now exist, where lifehacker (followers of the movement) can trade lifehacks – suggestions on how to reduce chaos and make their lives more enjoyable.